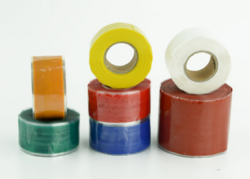 Silicone self fusing tape is special tape product that sticker to itself to create a moisture and corrosion resistant, electrical insulation, pipe and hose repair, or anywhere a quick and residue free wrap is needed. 1) ROHS, Halogen free, UL, REACH. 2) 500mm wide, 33m long. Polyimide tape coated with silicone adhesive, single sided, amber, UL certified. 1) Stable high qulity, but with reasonable competitive pricing. 2) Warm customer service, think what you need. 3) Fast delivery in 1~2 weeks for big quantity orders. 4) ROHS, halogen free, UL, environment friendly tape. 1) Class H insulation wrapping to transformer, coil, cable, motor. 2) Gold finger protection of PCB and FPCB in SMT industry. 3) Splicing tape to silicone paper, film, plastic and other materials. 4) Powder coating masking protection. 5) Good alternative to some famous brands. 1) UL Certified, reasonable choice to replace other brands. 2) Base glass cloth and silicone adhesive are from famous international suppliers. 4) 1000mm wide, 50m and 33m long. Glass cloth tape coated with silicone adhesive, single sided. 1) Stable high quality, but with reasonable competitive pricing. 1) Electrical wrapping and class H insulation to transformers, motors, coils, cable. 3) Flame retardant protection to air conditioning and other electrial appliance, automobiles, digital products, etc. 1) ROHS Certified, reasonable choice to replace other brands. 2) Base PTFE coated glass cloth and silicone adhesive are from famous international suppliers. 4) 500mm wide, 20m long. PEFT coated glass cloth tape coated with silicone adhesive, single sided. Looking for Electric Adhesive Tape ?